FireSpike, Author at Settlement Professionals Inc.
It’s no secret. Your injured client deserves better. A whole lot better than a crummy hand dealt from the injuries that bring them to your door. What they deserve is a better quality of life. One that will take care of all their needs. And then some. Creating an income always seems to be at the top of the list. Or perhaps a van with a lift to help them get around. Or making their house more accessible. Whatever the case, they need YOU to maximize their settlement to fund it. This means helping your client avoid or minimize the effect of those “others” who want to cut into their piece of the pie. Including Medicare. Do you risk your client not having any money left when the time comes to cover the eventuality of denied future medical bills? No. You decide to look into a Medicare Set-Aside (MSA) arrangement. Can they avoid it? Without the risk of Medicare denying payment? For otherwise covered services? Maybe. Maybe not. But if not, how much do they need to fund it with? As little as possible. And here’s why. Medicare is a secondary payer. As mentioned here, the Stalcup memo states that a settlement, judgement, or award must be exhausted for future services before Medicare can be billed. Exact text is below. This is the scenario you don’t want for your client. Especially, as paying denied Medicare bills could leave them with little or no settlement money. Using a portion of your client’s settlement to set up a voluntary MSA could limit the amount that future Medicare-allowable expenses can claim. The key? There’s no law that requires a certain amount. That’s right. Once your client exhausts this MSA amount, the law requires Medicare to pay your client’s Medicare-allowable, settlement-related expenses for the rest of their life. Thus, the less you set aside, the quicker this happens. And, the more settlement money your client keeps. The more settlement money your client keeps, the more it can maximize their quality of life. A simple solution. Now all you need to do is find someone who believes the same. Not to mention, someone who will minimize their MSA to the lowest reasonable and defensible dollar amount possible. There are three ways to go about this. All of them are included in the routine services provided by the PLAINTIFF’S MSA AND LIEN SOLUTION. The first step is to submit your client’s medical and billing records to us for a thorough audit and review. Our team of registered nurses must perform this critical step prior to creating any MSA Allocation Study. If the review uncovers that your client no longer receives treatment for the injuries or conditions that are the subject of the settlement, but their treating physician won’t put it in writing, we’ll provide a letter. This letter, backed by the authority of the government’s Benson memo, will state that no MSA is required. However, perhaps your client can’t avoid it. Also, perhaps a strategically-minimized MSA is still something they want to consider. Then we move on to step two. In this step our specially-trained RN and MSCC-credentialed nurses start preparing the MSA. Removing unrelated past medical and double billings, and then challenging unnecessary treatments in order to strategically minimize the MSA amount. Challenging unrelated past medical means getting rid of anything that doesn’t match up with the injuries or conditions that are the subject of the settlement. In other words, anything that doesn’t match the ICD-9 or ICD-10 codes associated with your client’s case. Then, they remove double billings and document and remove unnecessary future medical treatments. This process should significantly reduce the amount needed to fund your client’s MSA. But, we push it even further. Step three involves utilizing innovative strategies we’ve developed. These strategies reduce MSA funding requirements even more. But only for eligible clients. Part of this involves, at the discretion of the plaintiff attorney, using the procurement costs. Specifically, those expended in obtaining their settlement or verdict to further minimize the funding. Then, a final strategy. One that is so exclusive. In fact, we will only reveal it when you and your client come work with us. Before that, it’s all about what the right move is for you and your client. Can they avoid an MSA? Or not? Whatever you do, don’t make this decision alone. Sign up to receive our 2 Ways to Avoid an MSA article. Together, we can decide if one of these two ways can work for your client. And if it’s not possible to avoid an MSA? Then we’ll take you and your client through our proprietary process of minimizing their Liability Medicare Set-Aside. Ultimately, we’ll help you and your client create a strategically-minimized Medicare Set-Aside allocation. How minimized? One that comes down to the lowest possible, reasonable and defensible number. The end result? More settlement funds in your client’s pocket and less hassle for you, plus a quality of life that’s maximized to the fullest extent for your client. Nothing strikes fear and intimidates more than red ink. In fact, no other color elicits quite the same response. Perhaps this reaction stems from seeing correction marks in red ink. Over the years you become conditioned to those red marks. Red becomes a color that indicates something is wrong or needs attention. You can’t ignore it. In the case of the Medicare personal liability settlement Red Letter that your client may receive, this couldn’t be truer. If or when your client receives this letter, it won’t just need attention, it will demand it. In fact, it demands it now. And here’s why. You’ve settled a liability case for a client. Not just any client, but one who’s not Medicare eligible at the time of settlement. Meaning there’s no reason for the defendants or their insurers to report this case to Medicare. The Section 111 law of 2007 requires that defendants, self-insured or other responsible entities report settlements to Medicare. But, there’s more. They are motivated to report. Failure to report a Medicare-eligible beneficiary’s liability settlement to Medicare means a $1,000 per day, per claimant penalty. We’ll cover more about this law, and its effects, later. For now, back to our scenario. Had your client been Medicare eligible? Reporting would have meant disclosing ICD-9 or ICD-10 disease codes. These codes describe the injuries or conditions that are settled as part of the case. When these are reported to Medicare, they are filed away. Saved to match up against future bills submitted to Medicare. A match means payment is denied, and falls to your client to pay. Some casualty adjusters have disclosed that their firm reports all settlements to the government. Medicare eligible or not. What happens with non-eligible reports? No answer has come from Medicare yet. However, we live in an age where tracking of all of our tweets, emails and phone calls is the norm. This certainly suggests that Medicare could store this info for later. Yet, it appears that you and your client are in the clear. As, in our example, your client isn’t Medicare eligible at the time of settlement. Right? This is true. Until it’s not. When your client becomes Medicare eligible post settlement. At this point, Medicare will send them a SECONDARY CLAIM DEVELOPMENT (SCA) Red Letter. This letter includes a three section questionnaire. The second section, “More Information About You,” being the most alarming of them all. It starts out harmless enough with a request for some general information in Section I. Not bad. So you move on. Below is the second section of this letter. It asks if your client is receiving Black Lung Benefits, worker’s compensation benefits or treatment for an injury or illness which another party could be held liable for or is covered under automobile no-fault insurance. A simple yes or no is all that’s there to choose from. Then to the left of each of these questions they ask for dates. Sections asking for in depth information about their insurance carrier immediately follow. Most clients answering “Yes” to #3 will probably enter their auto insurance carrier here. Not too bad. But then there’s more. And it gets worse. As this section continues to the second page, you’ll notice things go alarmingly in depth. Detailed information about their employer (being disabled and on Medicare, they probably don’t have an employer), their attorney, (that’s YOU), and then a brief description of their illness or injury. All required. Why does this matter? It matters because Medicare now knows about your client’s settlement. That’s right. Soon, they will have all of the information they need to match bills and deny payments later. This is not good. Really not good. Also, there is no way to get out of this. Now you realize, eligible or not at time of settlement, you’re not safe. Medicare will find out about your client’s settlement. And when they do? They will not pay for future expenses. In fact, they will cut off your client’s Medicare benefits for those conditions and injuries. Those that are the subject of the settlement of your client’s claim. What does this mean for your client? Less funds for other needs. Unless proper settlement planning has occurred from the beginning. Or, it could mean that your client has already spent their settlement. Meaning that they have no money left with which to pay denied Medicare bills. What does this mean for you? At the very least, an angry phone call. If your client is being crushed under a pile of denied Medicare bills, possibly a bar complaint. Or worse, a malpractice claim. Neither of these are good. But there is a solution. It involves looking at an MSA as a useful tool instead of a dangerous weapon. In fact, a “strategically-allocated” and administered custom MSA account, minimized to the lowest reasonable (and therefore, defensible) dollar amount possible, may be your protection-seeking client’s best defense against not having the money to pay denied Medicare bills. The additional benefit? Your client may have effectively “capped” their exposure to Medicare. More importantly, at the amount that is ultimately funded into their MSA. What if your client does nothing in the way of considering Medicare’s “interest?” Or protecting the Medicare Trust Fund from becoming a primary payer on their settlement-related medical bills? Then, Medicare may take the position (as they do in Worker’s Comp cases) that your client must prove that they have spent their entire settlement. Specifically, including the amounts they paid you for fees and legal costs, on Medicare-allowable expenses. And guess what? That is before Medicare will jump back in and pay one thin dime. However, if your client has voluntarily created and funded a custom MSA account, and that account has reached either “temporary” or “permanent” exhaustion (out of money) then good news. By law, Medicare has to cover your client’s settlement-related, Medicare-allowable expenses for up to the rest of their life. Effectively, this is what it boils down to. In order for your client to get into Medicare’s pocket, they must prove they spent their “entire” settlement (BIG NUMBER) or that they have exhausted a minimized MSA (smaller number). Which do you think your client will prefer? Take control of your client’s Medicare issues with the help of The PLAINTIFF’S MSA AND LIEN SOLUTION. Our tools will help you and your client determine whether they have a potential Medicare issue in their future. And, if so, whether they can first use one of our “2 Ways To Avoid an MSA.” If an MSA can’t be avoided and it looks like Medicare could be a problem for your client, they may want to voluntarily fund an MSA account to solve it. Then, our team can create a strategically-minimized Medicare Set-Aside allocation to the lowest possible, reasonable and defensible number. Leaving them with more settlement funds and you feeling like you’ve done everything you can to protect them from this situation. By now everyone knows that liability settlements do not legally require MSAs. Yet, a strategically-minimized MSA from The PLAINTIFF’S MSA AND LIEN SOLUTION may still be a strategy worth considering. That is, as a means to provide the money to pay your client’s future Medicare-allowable, settlement-related medical bills. What you don’t know about Medicare reporting and skillful use of MSAs to avoid major client Medicare issues can affect your time, money and reputation. Let us help you through it. The PLAINTIFF’S MSA AND LIEN SOLUTION is here for you. Please visit our website at www.plaintiffsmsa.com or call us with any questions at 888-672-7583. MORE MONEY FOR CLAIMANTS. LESS STRESS FOR TRIAL ATTORNEYS. Face it. ERISA liens are no picnic. And resolving them isn’t getting any easier. In fact, it’s become more complex, especially with decisions like McCutchen vs. U.S. Airways. Cases like these have forever changed the way ERISA seeks reimbursement from plaintiffs who later receive a third-party settlement. So what do you do? If you’re an experienced plaintiff attorney, it’s been ingrained that resolving these liens yourself at no charge is simply part of your job and something you should do. However, you may be rethinking that approach. And if you’re a newer plaintiff attorney, you may already have decided that you are not going to deal with them. Regardless of who you are, experienced or newer trial attorney, the stakes are higher and mistakes are easier to make than ever. Here’s what you should know. When attempting to resolve ERISA liens, one of the most common mistakes is not being honest with yourself. Ask yourself if you really care what your client pays back to his or her ERISA plan, or what their net settlement is. If your answer is “yes” on the outside, but you really don’t want to make a federal case out of it, answer the question “no.” Sure, you could press on for seven years like McCutchen’s team did and take it all the way to the Supreme Court, but would it be worth it for you or for your client? If not, make your deal, convince your client what a great job you did and MOVE ON. Another common mistake, and this is a big one, is to proceed WITHOUT the ERISA Plan Document (EPD). The EPD is supposed to contain specific legal language that allows the ERISA Plan to seek full reimbursement from any settlement a member receives as a result of a third-party injury. In the McCutchen vs. U.S. Airways Supreme Court ruling, the Supreme Court cites this language from the U.S. Airways Summary Plan Document (SPD). However, the SPD is no replacement for the EPD itself, which the Supreme Court ruled reigns supreme. 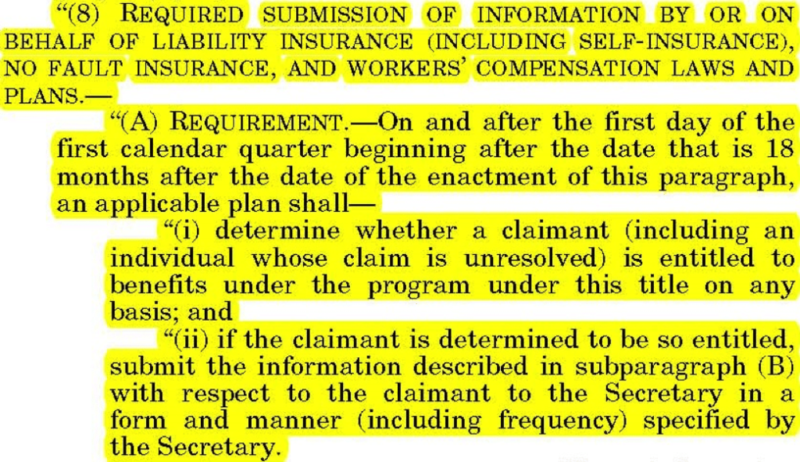 It’s important to note that if the aforementioned U.S. Airways reimbursement language hadn’t also been in the ERISA plan document, as sometimes it is not, this ruling would probably not have held. This is precisely why it is important to only proceed with the EPD. If you choose to proceed without the EPD then you really do not know if the ERISA Plan has the legal horsepower to exert a lien on your client’s settlement. The moral of the story? Don’t be a fool and proceed without the ERISA Plan Document. If you STILL choose to proceed without the EPD, ask yourself again if you really care what your client pays back to their ERISA plan or what their net settlement is, and this time answer truthfully. The third, and biggest mistake you can make, is to do it yourself. As new rulings make resolving lien cases more complex, it’s easier for mistakes to crop up. These mistakes can greatly cost your client. Why take that chance? Instead, make sure your retainer agreement has a provision that allows you to hire outside sources. With proper outsourcing, outside legal teams can make arguments that plaintiff’s counsel may be constrained to make. Better yet, when you decide to outsource, take advantage of resolution services for ERISA liens from The PLAINTIFF’S MSA AND LIEN SOLUTION. Our lien team at Precision Resolution will put your client in the best possible position to obtain a great result from the resolution of their ERISA Plan lien. Our team is full of relentless lien hitmen. Since 2011, we have put millions of dollars back into plaintiff’s pockets. Specifically, through relentlessly and successfully challenging, reducing and eliminating lien claims. Not to mention, we have also significantly reduced attorney exposure to complaints or claims stemming from lien issues. With a team like this there’s no need to go it alone, or take risks. Put our team to work for you and your clients now. Outsource your case to us here.